Of all the tools I tried to get working, Dan Kaminsky's OzymanDNS was the only one I could find that actually works for Windows. Maybe there are others out there (link to them in the comments!) but I didn't find any at a glance. Also, Doxpara seems to be down, so here's a mirror of the source package for Linux/Unix/BSD/OS X. This is generally okay, because OzymanDNS is a fine solution in and of itself, even if it hasn't been updated in five years or so. OzymanDNS server runs fine on Mac OS X, Linux, and BSD. It's all in perl, and heck, it might even work under cygwin on Windows. I haven't bothered trying. I'm using Linux as my server for ozymanDNS. This installs the DNS and Base32 perl modules that Kaminsky's scripts need. Someone made executables of these tools for Windows. You can download the Windows version of OzymanDNS (as well as putty and some DLLs) here. I recommend copying the DLLs and droute.exe into your path somewhere, like C:\Windows\System32 for example. Once you're on the road and need to tunnel, configure putty. Click the screen shots below for full size. Connection/Proxy, select the "Local" radio button, the "Consider proxying local host connections" check box, and enter "droute -r [DNS Server] sshdns. [your subdomain]" as shown below. DNS server should probably be whatever DNS server you were assigned via DHCP (use "ipconfig /all" from a command window) - I really don't know why you need something prefixed to your subdomain for ozymanDNS to work, but I always use "sshdns". Switch to the Connection/SSH option in the configuration tree and enable compression. Next, set up a Dynamic tunnel on port 8080 (or whatever you want) as displayed below. Then finally go back up to "Session"and connect to Localhost port 22. Since this is a lot of work, I'd advise you to type something like "tunnel" into the "Saved Session" box, and save it. This will save you a lot of hassle down the line. 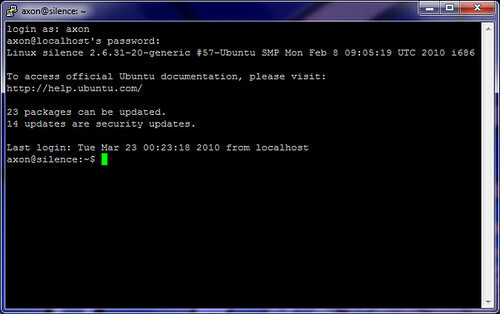 If all goes well, you'll be prompted to verify the SSH key for the connection, and then be allowed to log in. You'll also have a working Dynamic SOCKS tunnel thanks to this session. 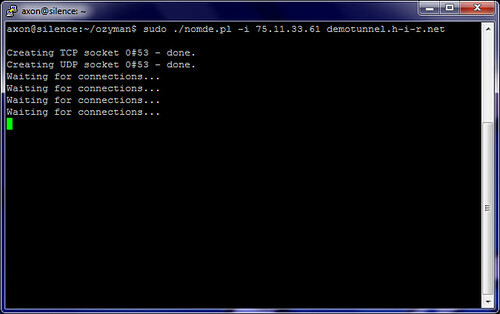 Again, I should remind you that this method of tunneling can be slow by nature of how DNS works. Tunneling more traffic over it, via SSH tunneling will be even slower. We try to mitigate that with Compression above, but it only helps so much. 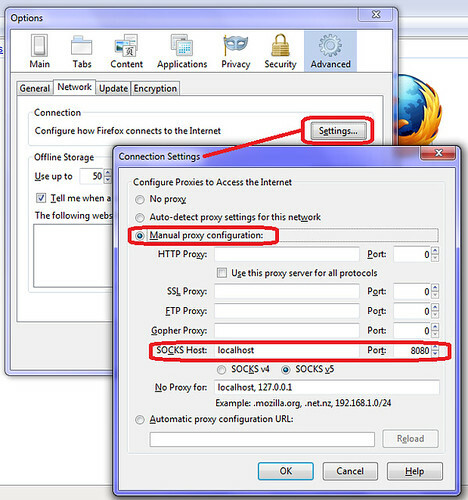 Now, configure Firefox to use the dynamic proxy. Tools/Options, Advanced, Network, Connection Settings. Use localhost for the SOCKS proxy host, and set the port to the one you configured in Putty. The final test is to make sure that we are actually going through the tunnel. I chose the old standby WhatIsMyIP.org. I won't cover using ozymandns under Linux or BSD, but it works well enough. Use this on the client end to get a dynamic SOCKS proxy on port 8080.